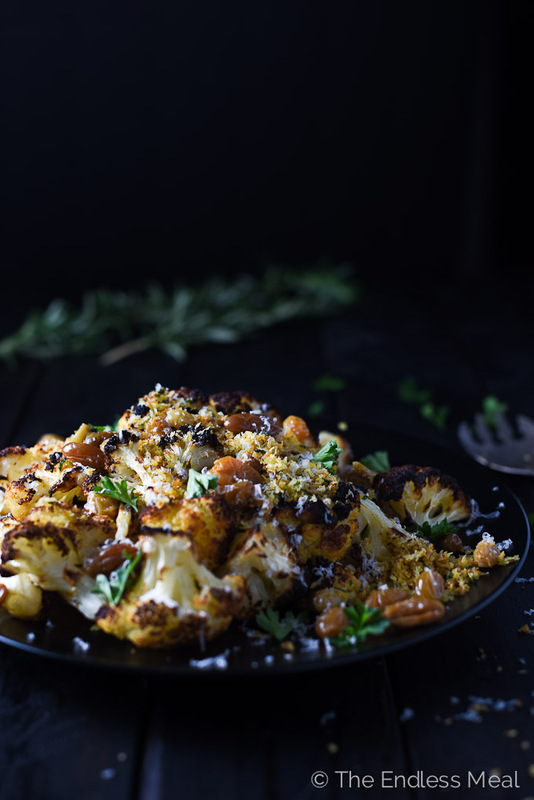 This blackened cauliflower is one of the best side dishes you could imagine. 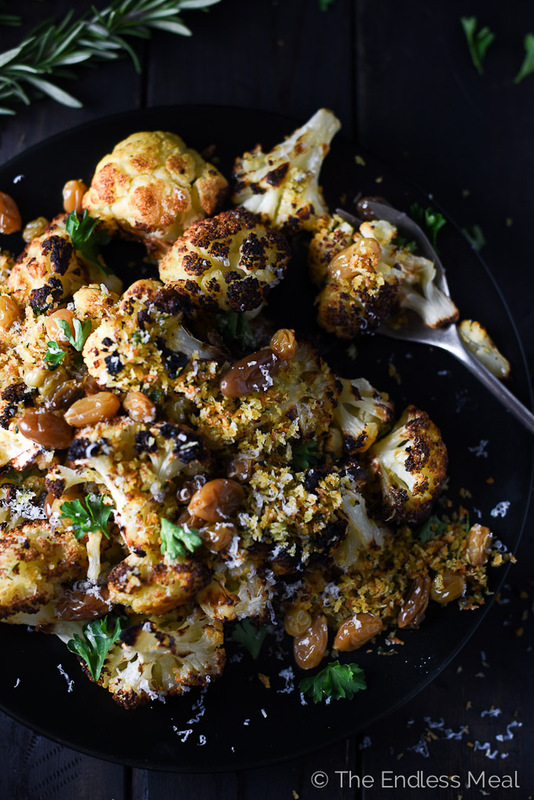 The cauliflower is roasted until it's very dark then topped with crispy herbed panko and sweet, plump raisins. I'm blaming it on the holidays, working on the 5 Days To Your Own Food Blog course and too many cookies. Yes, cookies. I've been eating a ton of cookies lately. But that's another story. Today is all about this blackened cauliflower. I know it's supposed to be a side dish, but if you put a giant plate of this in front of me and tell me it's dinner, I'll probably jump up and kiss you. ? 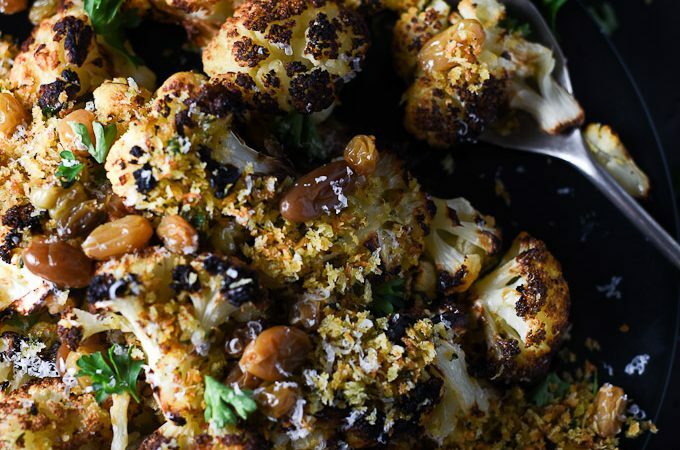 What happens to the cauliflower when it spends enough time in a hot oven to become dark brown is nothing short of dreamy. It takes on a rich, nutty flavour that makes me swoon. Then there's the herbed panko. It's salty, crispy and full of flavour. Somehow it even manages to taste buttery, even though it's toasted in good for you olive oil. I'm going to keep this short and sweet today. You guys, please (please!) go make this blackened cauliflower. If you make this Blackened Cauliflower with Rosemary Garlic Panko make sure to snap a pic and tag @theendlessmeal on Instagram so I can like and comment on your photos. I love seeing TEM recipes you create! This blackened cauliflower is one of the best side dishes. It's roasted until it's very dark then topped with crispy herbed panko and juicy raisins. You will LOVE it. Place the cauliflower florets in a large bowl and pour in 2 teaspoons of the olive oil, the sumac and a good pinch (or two!) or sea salt. Use your hands to toss everything together well and then pour the cauliflower out onto the prepared baking sheet. Bake in the oven for 30-40 minutes, or until the cauliflower is very brown. While the cauliflower is roasting, prepare the panko and raisins. Place the raisins in a small pot and cover them with 1″ of water. Bring the pot to a boil then reduce the heat and let it simmer for 10 minutes. Drain and set aside. Heat the remaining teaspoon of olive oil over medium-high heat in a small frying pan. Add the garlic and rosemary and cook for 30 seconds. Add the panko and mix everything together well. Continue to cook, stirring occasionally, until the panko is light brown. Stir in the finely minced parsley and a pinch of sea salt. Place the cauliflower on a serving platter and sprinkle the panko, raisins and parsley over the top. Add an extra pinch of sumac for colour, if you'd like. Both the panko and raisins can be made up to 2 days in advance. Store the panko in a sealed container in your pantry and the raisins in your fridge. Allow the raisins to come to room temperature before using. Yeah, I could totally eat this by myself 😉 It sounds delicious Kristen, cannot wait to make it! LOVE roast cauliflower. Best way to prepare it, IMO. You’ve really raised the bar with this recipe, though — you’ve added so much flavor! Really good stuff — thanks. This sounds wonderful. 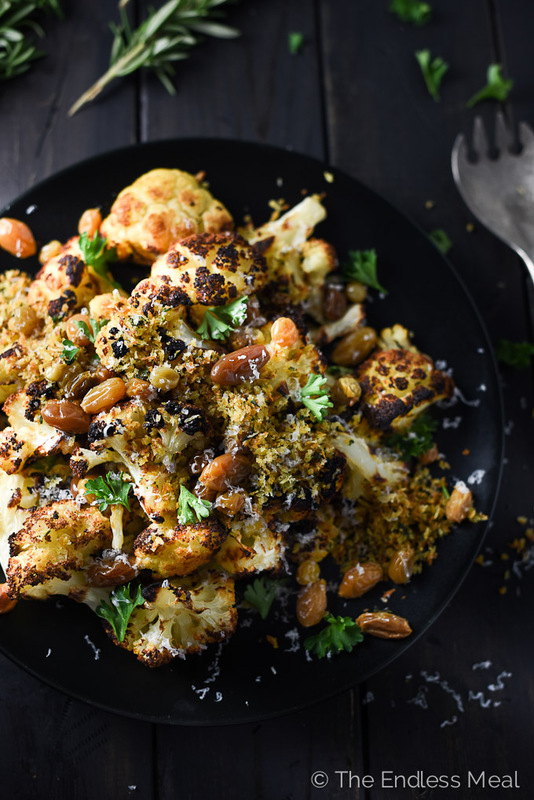 I love roasted cauliflower, a big favorite in our home., and the rest sounds really tasty. By the way, I just made your rosted veggie’s with the satay sauce last night (used peant butter rather than almon butter this time). That was great! I’ve tried being vegetarian or vegan, but get bored. Not with things like that though, so flavorful. I bought Romanesco this summer and loved it. They’re so ridiculously pretty!